With the recent development of Thrive reaching version 2.0.2, we have included a very helpful tool to get you started. 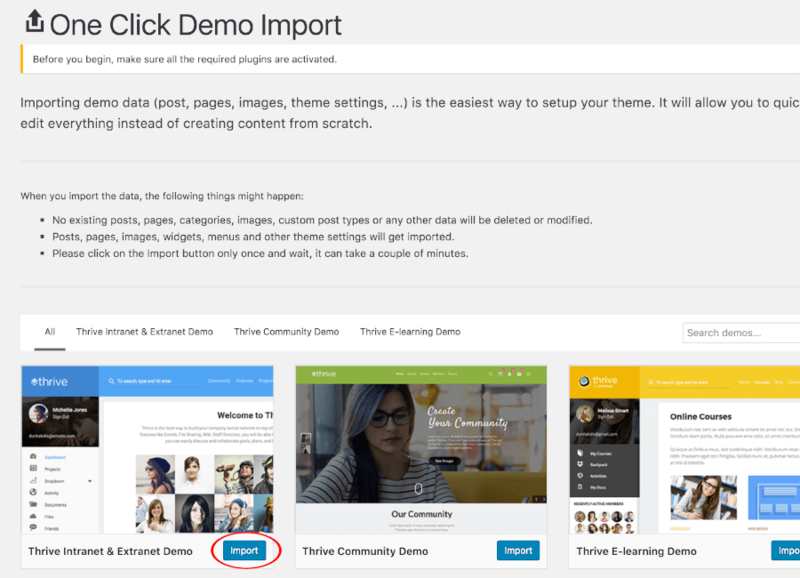 This tool is called ‘Thrive One Click Demo Import,’ this will allow you to choose a particular demo and import its Contents, Menu(s), and Customizer’s options – with all just a click of a mouse. To get started with “Thrive One Click Demo Import“, we have prepared a step by step tutorial that will get you going. So, let us start. I would like to assume that you have already uploaded the theme in your wp-content/themes using FTP or WordPress Theme Uploader. If you have not uploaded the theme yet, please visit this link and follow the methods to install your new Thrive WordPress Theme. Okay, so first things first. Let us activate the theme through ‘Appearance’ > ‘Themes’. Activate ‘Thrive’. After activating Thrive WordPress Theme, we need to install all the recommended plugins. Go to ‘Appearance.’ > ‘Install Plugins’. Select all of the Plugins and click ‘Install.’ The Installer will now proceed to download the plugins from WordPress.org repo, and premium plugins from a private repository. Kindly wait for 1 to 2 minutes for the demo to finish dumping all the necessary contents. Once everything is done, go to ‘Settings’ > ‘BuddyPress’. Under ‘Components‘ Tab, enable everything. ‘Site Tracking’ can be optional. We can now proceed to import the demo contents to start working on your website. Scroll down a bit and choose the demo import that will be install in your website. After deciding which demo import to install, click ‘Import.’. Note: For E-Learning Demo, you need to install and activate LearnDash plugin. Wait 3 – 5 minutes for the installation to finish. Some sites might take longer, but it all depends on the speed of your server and your download speed. * Activity Stream, Members Page, Groups Page in the menu is not working correctly. Go to ‘Appearance’ > ‘Menus’ and select a different page (members, groups, activity), this is happening because BuddyPress has automatically created a new ‘page’ for you and it will un-assigned the old pages (mostly from the import). 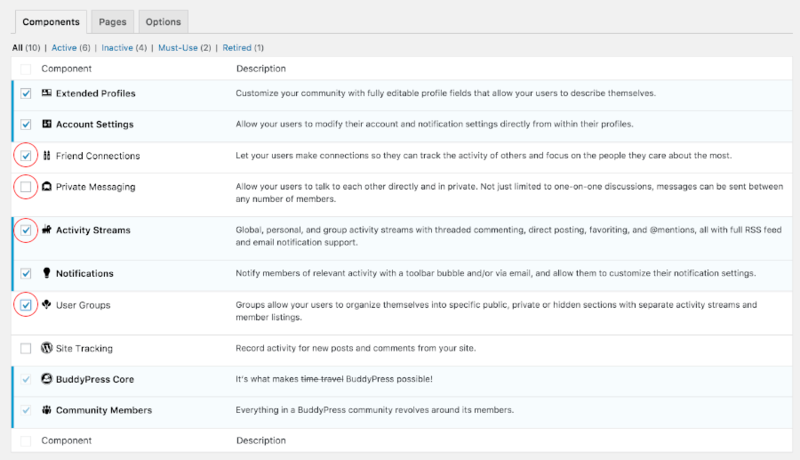 You can also assign a new members page, groups page, activity page to ‘Settings’ > ‘BuddyPress’ under ‘Pages’ tab. * Maximum execution time, PHP memory limits, etcetera. This issue can be fixed easily by adjusting your memory configuration. Go to this link to proceed. How do I buy and install ? Here is the link to learn more about Thrive (http://thrive.dunhakdis.com/preview/index.html). Scroll down and you should see a Download button. Click on the said button and it will take you to Envato Marketplaces to complete the purchase. Please let me know if you need more help ^_^. I tried to install the Thrive Intranet & Extranet demo content but a lot of the files failed to import. I’m on an IIS8 Windows Server. I have a problem I guess. The register page isn’t showing up. Any tips? I changed the demo from Intranet Demo to Community Demo. I want to go back to Intranet Demo but it will not change. Stays in the Community Demo. Any suggestions on how to get back to the Intranet Demo?